It’s unclear how many people gain weight in aftermath of death or why some people lose their appetite when sad, while others seek out food for comfort. But the body’s response to grief is similar to its response to stress in general, and for some people, both a loss of appetite and an uptick in appetite can occur. This may explain why in some accounts of grieving, people describe initial weight loss in the period surrounding the illness or death followed by rapid weight gain as part of the long term coping strategy. A woman posted on Reddit detailing the struggle of losing 15 pounds when her grandmother was diagnosed with terminal cancer. After her grandmother died a few months later, consumed with grief, and surrounded by a steady stream of well-intentioned bereavement food, she discovered she’d gained the full 15 pounds back. 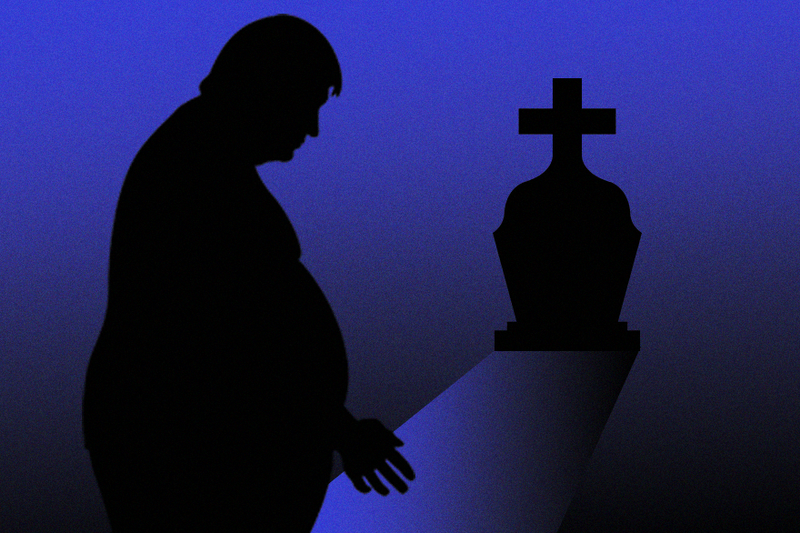 According to some research looking at bereavement in adults from psychiatrist Colin Parkes, “the appetite for food is often the first appetite to return.” Parkes found that the initial weight lost typically returns within three months, and that six months after the death is when excess weight tends to appear. “It may be many more months before people begin to care about their appearance, and for sexual and social appetites to return,” Parkes writes. Some grieving people write that they gained weight whether they ate more or not. On the site Grieving Parent, blogger Joe Mudd writes about his “grief gut,” chronicling how his struggle with weight began in college, but that he was able to successfully lose and keep the weight off until his son died, at which point, he says, his body began to “store weight like crazy” no matter what he did. Fellow grievers and weight gainers chime in with support in the comments, mentioning that whether they ate more or less, the weight piled on, and they can’t seem to shake it. For others, there’s a clear and deliberate choice to consume food. For one person it’s too many donuts or cookies, for another it’s too much wine or pumpkin soup. But the result is the same: While some people can’t seem to force a thing down, or even feel guilty for eating a bite, others find that eating is the only salve. It temporarily satiates, and if nothing else, distracts from the pervasive, profound numbness or sadness of loss — particularly when food is being provided freely and excessively as an act of kindness by others. Food has a long association with funerals, and showering grieving people with victuals is not just considered neighborly but fundamentally human. The particulars of the ritual may vary, but showing up with your culture’s equivalent of a casserole after someone dies appears in cultures all over the world. (In the South, you take them a ham.) But what happens once the respects have been paid, and your freezer is stuffed with lasagna? What’s more, because grief is so highly individual and can be so unpredictable, it’s understandable that food is appealing precisely because it’s a known quantity that can be controlled in a time of meaninglessness and chaos. That was the case for Jehan Roberson, who wrote at Vice about her experience grief eating her way through four major losses in an 18-month period, where she ballooned up and down from eating and drinking to numb the pain. Roberson spoke to an expert on eating disorders, Melainie Rogers, who told her that reaching for food to soothe is among the first things we seek out for pleasure, but that this only becomes problematic if the eating continues even after the person has moved on from the grief. Rogers said thinking that she ought to be able to simply conquer the problem, as if it were a matter of willpower, wasn’t going to solve things. (There are some signs of disordered eating related to trauma or grief, which can include recurring bingeing episodes.) This is why in many posts online about grief weight, the former grievers have moved on but find themselves older and heavier, struggling to get the weight off. In Van Ness’ case, in the two years it took him to drop the weight, he’s since become devoted to yoga, which he chronicles often on Instagram. But based on the supportive responses to the before and after photo he posted from commenters who’ve faced their own challenges and setbacks losing grief weight, it’s clear that the last thing someone who put on some kummerspeck needs to feel is more guilt or pressure about it.